We (Bryan Oczkowski and Bobby Bray) plan to assemble 2 computers as 2 stand alone audio processing units. They will be running Pure Data (PD) on the Linux operating system. Sound cards and breakout boxes with 1/4” mono input and output jacks will be used. 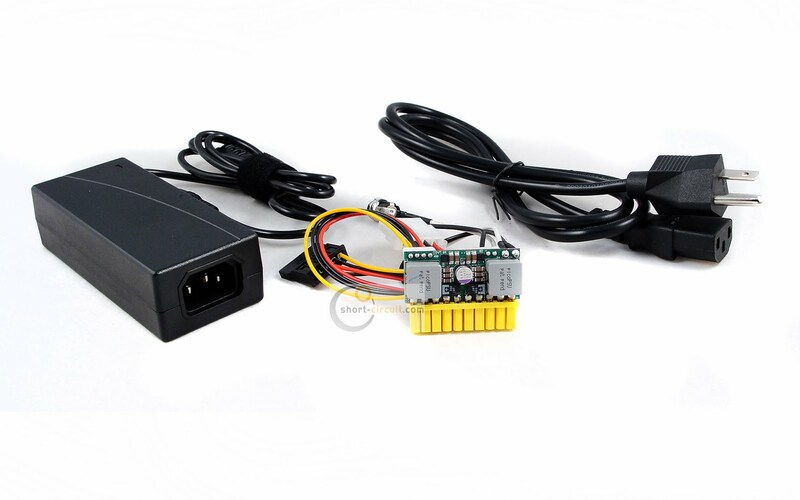 Knobs, switches, buttons, and joysticks movements will control PD parameters. Two models will be made: a floor unit designed to fit into a pedal board arrangement, and a unit focused on hand controls. An important aspect of these units is that the user will be able to upload different PD patches and presets. The user can define which parameter each knob or switch controls, completely alter the patches, as well as change the routing of the different patches by uploading different presets. The open source aspect of the software, as well as the ability to change or write new effects, will free the user from the limitations of on-the-self effects units sold on the market today. We plan to use 2 Arduino Mega each (16 analog ports per Mega) to convert the physical movement of knobs, buttons, switches, and joysticks into usable digital information. All of these parameter controlling elements will control whatever the patch assigns them to control. 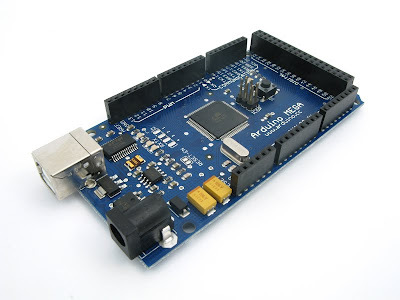 A PD patch and associated firmware collectively known as Pduino will be uploaded to the Arduino Mega to convert the analog input coming from the knobs and switches to the Arduino Mega. An LCD Arduino Shield will be used to display knob/switch assignment and the current preset's name. 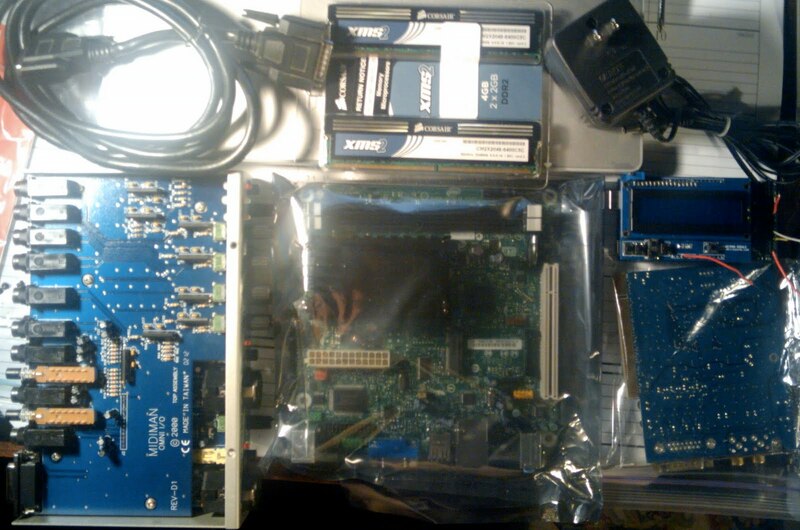 Our Pure Data Machines will use the Linux operating system, running PD exclusively. The hard drives will be thumb drives, and can be removed at anytime to update presets and patches. The PD effects that will be used include a ring modulator sequencer, samplers, and pd versions of Soundhack plugins (such as Decimate and the Bubbler, which is a delay granular synthesis effect). Week 1. Finish all research regarding components needed for purchase, and design final layout with a schematic and flowchart. Week 2. 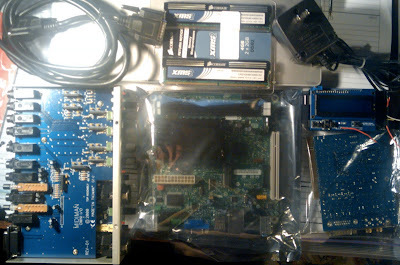 Purchase (order) motherboard, LCD or touchscreen, Arduinos, and all related parts (knobs, switches, etc.). Week 3. Finish PD layout / inner workings for initial running patch, with at least one preset ready. Week 4. Have case / shell cut, drilled and ready. Week 5. Assemble computer components and attach all knobs, switches, buttons, and joy stick to case. Do all soldering necessary. perhaps use 2 Arduino Megas each = 32 analog input ports; possibly a separate attachment consisting of several expression pedals or joysticks. Or SoftStep as attachment. for the output: a passive DI box will be used in reverse (through transformer) to get back to guitar level/impedance, or just a volume boost circuit. Upon completion of these PD effects units, we will be able to upload any and all inventive PD patches written by us or the PD community. The parameters of these effects can be manipulated through knobs, switches, and joysticks. On the LCD screen, the user will be able to scroll through the knob and switch assignments of the preset that is selected. Presets are selected by button switches. 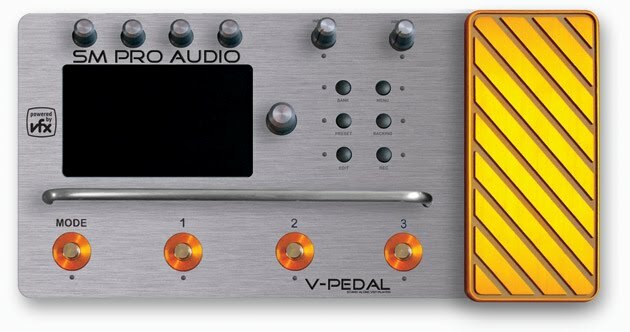 The Pd Pedal unit will be road worthy and ready to be implemented onto already existing pedal boards if desired. The table model will also be sturdy and durable. Any instrument will be able to plug into the units through the 1/4” instrument inputs. 1/4" outputs will allow the user to plug into an amplifier, PA, mixer, etc. We will compose and preform a composition using the devices. However, the users of this device must learn the new software written specificity for it. The layout of the software is centered on altering predetermined parameters of predetermined effects (repeats of a delay effect, for example). If one wished to invent something a bit more exotic such as a step sequencer ring modulator, it would involve altering the software's code – not very inventor friendly. 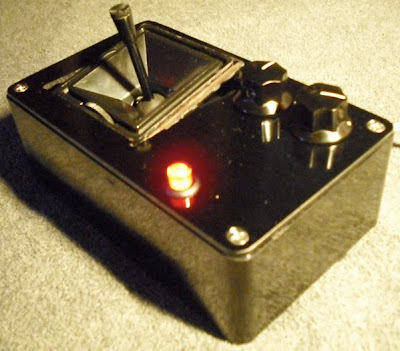 Zvex, a smaller but popular effects pedal company has just released news of a non software open source stomp box called The Inventobox that will be available in April of 2010. Schematics for Zvex effects can be found online which can guide people interested in hacking / altering Zvex effects using the Inventobox. The $400 Inventobox comes with a circuit board containing three Zvex effects: tone, fuzz, and "super hard-on," which can be altered by switching out components. 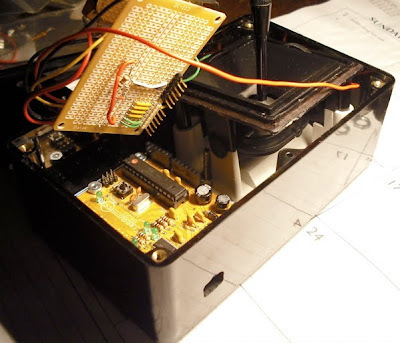 A $300 Inventobox will come without the circuit board; essentially a box with knobs, breadboard and jumper wires. A pedal which can run VST pluggins called the V-Pedal is not out yet, but seems promising. However, its questionable if it can run more than one at a time with only 512 GB of memory. Also, the user cannot alter VST pluggins. At least not very easily. Other than that there does not seem to be a stomp box which can upload and store effects. We searched mostly for PD and Max/MSP devices, but were surprised to not find much at all. Cons- you have to learn their new software interface and its a pain to design your own effects outside of their predetermined parameters of standard effects: flanger, phaser, chorus, reverb, delay, distortion. in order to make experimental effects you would have to manipulate their code it seems. Pduinopedal by Bobby Bray: an Arduino, two knobs, and old IBM joy stick used to control parameters on PD patches via Pduino. This unit was connected to a computer through USB during usage.